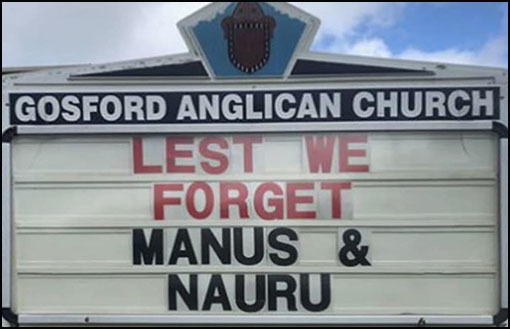 Here’s a story about a minister, a church, that warms my heart: Father Bower, of the Gosford Anglican Church, had written a message on the church's outdoor sign that read "LEST WE FORGET MANUS & NAURU", a deliberate echo of the controversial Facebook message posted by engineer and Muslim feminist activist Yassmin Abdel-Magied on Anzac Day last year. The posting led to her receiving a barrage of abuse and threats, eventually contributing to her leaving the country to work in Britain. It’s the same for the good minister … abuse and death-threats. But he didn't expect to see "I'll set that church on fire" in the comments, especially not from a man who was wearing what appeared to be an Australian Defence Force uniform. Father Bower said: "We have had other occasional threats of arson, always from the extreme right of our nation's political spectrum, ironically from the very same people who warn that Muslims will 'burn your churches down'. A Muslim has ... never threatened me in any way." I’m on record for being critical of religions, in so many ways ... RELIGION 1, 2, 3 in my book en.light.en.ment ... but there is one aspect of religions I acknowledge: They potentially provide valuable social services and a coherent community structure; and in this case, a welcome reality check on where our government is going awfully wrong. 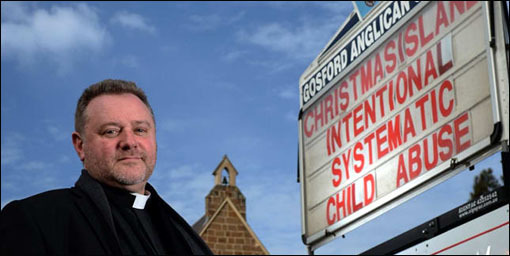 Stick it to them (Turnbull, Dutton et al), Father Bower, I say.